Parents are often concerned about whether foods, such as sweets, are safe for their children to consume if they contain copious amounts of E numbers. If you want to be able to treat your children to something sweet, but don’t want to expose them unnecessarily to E numbers, then here are some ideas for E number free alternatives. It’s often assumed that the best place to find more natural alternatives to sweets, confectionary and snacks is in a health food store. Whilst it certainly is possible to find more natural products lurking within its shelves, it’s sadly not always the case that all products will be E number free. In the case of sweets and other goodies that children may enjoy, it’s as essential as ever to check the labels of products in natural health stores as you would in any other shop. It’s definitely possible to find some good brands and makes that you may not have heard of before in health food stores, so do have a look if you’re interested in exploring alternative products. Although there are some sweets which do contain E numbers, to make products look and taste better, it is possible to find children’s sweets that are E number free. It’s worth noting that some children’s sweet manufacturers, including Swizzels Matlow (who make old favourites such as Love Hearts and Drumstick Lollies) are now working hard at cutting artificial colourings out of their products. You’ll also find some fruit sweets suitable for children or adults that use real fruit juices in them and are made up of more natural ingredients, rather than artificial ones. It does pay to check the labels though, just to be 100% sure about what you’re buying. It’s tasty and sweet and everyone loves a piece of chocolate now and again! If you choose your chocolate carefully, you can find good quality products that don’t have nasty E numbers or synthetic ingredients in it. Avoid the traditional sweet-shop style confectionary chocolate, as this is the biggest culprit for unwanted added ingredients, and buy a good make of pure chocolate. 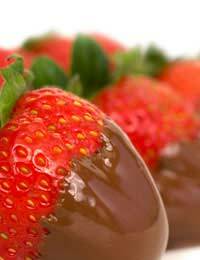 Whilst dark chocolate is the best for being pure and unadulterated, milk chocolate tends to appeal more to children. Another chocolately alternative is to find a good quality and ingredient-friendly chocolate spread. Children will enjoy an occasional treat of having this spread on toast or perhaps you could dip plain biscuits or bread sticks into it for a sweet treat. Both fresh and dried fruits are great for a natural sweet high. Dried fruit, such as dried apricots, raisins, sultanas and pineapple are widely available and come in handy snack pack sizes, which are ideal for a child’s lunchbox. Do be careful when you’re buying these though, as some dried fruits have a preservative included in the ingredients and this is sometimes an E number. So don’t forget to look carefully to ensure you’re buying as natural a product as possible. It’s hard to resist the sound of the ice cream fan and children love ice lollies. This type of product is often packed with E numbers, but if you buy carefully, you can find alternatives without unwanted additives. If you’re really keen to avoid E numbers at all costs, you could even have a go at making your own, with frozen pure fruit juices. Can you please guide me which type of gluten free flour is free of any preservatives or E numbers. Which brand of non dairy milk is good for children to drink? Thankyou and keep up this very interesting and useful work.